We know how to tell the age of a tree by looking at the rings inside the base of the tree. Not only do the rings tell us the age, but malformations in the rings may also reveal traumatic events during the life of the tree. Some scientists believe that Saturn’s rings formed with the creation of the planet. However, others disagree. The rings are made of ice particles, and the planet would have been so hot when it formed, that it would have vaporized and driven away any icy material. 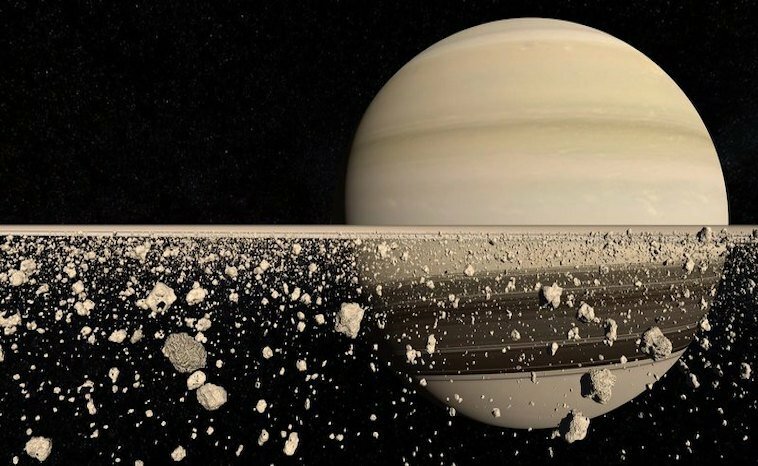 The same scientists that believe that the rings were not part of Saturn’s formation assert that the rings come from debris. The collisions of comets, other objects, and Saturn’s icy moons created the rings. The ice would quickly settle into the equatorial plane, and some would become trapped in rings. Furthermore, the ice would waste away from meteorite impacts and radiation in Saturn’s magnetosphere. New impacts could replenish the rings with fresh ice. How often do these collisions occur? Speculation exists that this happens every 100 million years. The bright, beautiful rings you see today may be only a temporary enhancement caused by an impact that occurred since the extinction of the dinosaurs. A recent article published in Science Magazine, Jan 2019, states that studies from the Cassini mission place the age of the rings between 60 and 100 million years old. How did the Cassini scientists determine this age? In the last stages of the Cassini mission, the spacecraft dived between the planet and the innermost ring. This ring sits 2600-3900km (1600-2400 miles) above the cloud tops of Saturn. Scientists shut down Cassini’s propulsion system to allow gravity and momentum to guide the craft. This report by Cassini gave scientists stable readings regarding the rings of Saturn. Using a radio link with Earth, scientists measured the gravitational field of Saturn and the mass of its rings. What keeps the rings from dissipating into space? Saturn’s moons keep the rings in place. The ring particles get caught in the most stable orbits amount Saturns innermost moons. Those inner moons, or shepherd satellites, get locked in place by the larger outer moons. Without the moons working back and forth, the ice chunks and particles would float away. When adding all the rings together, they comprise a total mass of 15 billion kilograms. Scientists were surprised to learn about the size of the mass. They had speculated that the rings contained more mass. However, a lower mass meant that the rings were indeed young. This makes the rings younger than the planet. The A Ring holds the purest ice. The Cassini Division has the dirtiest ice. The C ring contains boulder-size chunks of ice and has particles half as bright as the A and B rings. The A and B ring have smaller ice chunks similar in size to golf balls. The C Ring particles have less ice and more minerals. Scientists still have more data to look at from the Cassini mission. We look forward to learning more about Saturn and its hidden mysteries. Name a star now! - How Old Are Saturn’s Rings?